Eddie was inspired by his new favorite video game, Cooking Mama, so he insisted on making dinner tonight. This video game is one of those games that only the Japanese would come up with. An anime "mama" (who looks no older than 12 herself) gives you instruction on cooking recipes, and you earn medals if you do them correctly. It's actually very fun, and somewhat educational. 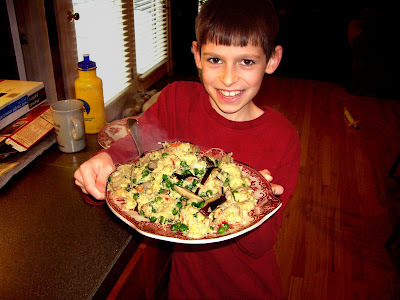 Eddie decided he would make us dinner tonight with his favorite Cooking Mama recipe, Omelet with crab, peas and shitake mushrooms. Eddie did all the cooking, including the prep work and setting the table. I even let him choose the wine, and he chose a nice sake. Dinner was delicious! Good job, Cooking Eddie! 8. Pan fry over adjusting heat. Press 4 times. Flip at the end. By the way, Eddie thought this recipe might be enjoyed by Nana, Grandpas Duke and Warren, and especially Tio Adolfo! He knows Grandma Duke doesn't like crab. Great job Eddie!! You are a budding gourmet, just like your Daddy was at your age! Your omelet looks delicious. I will have to go get some crab so we can make this. Something else that is also delicious is to use lobster instead of crab. We've had that before at George's. Keep up the good work. The next time you come to visit, you can cook something here if you want to! I am catching up with your posts... YUMMY!!! EDDIE COME TO US!!!! That looks FANTASTIC! Becky and Scott being great cooks, no wonder Eddie is getting it! I love ALL of your meals when we visit you. Miss you all!